When I started blogging about my “yard farm” back in February, I knew that I would not have quite as much time to write about my garden once the weather warmed up and I’d be outside, actually working in my garden with my plants instead of writing about them. And the boys — well, they’d want to be outside if it were 33 degrees and pouring rain — but they want to be out in the yard and garden as much as I do when it’s been as pretty as it has been lately. In addition to the call of the nice weather and growing “to-do” list in the garden, a few weeks ago I accepted an offer to work part-time for an organization I’ve been volunteer teaching with (Teach the World Online). All of the work I do for TWOL is online, so that’s a couple hours of time in front of the computer each day (all quite interesting, though! 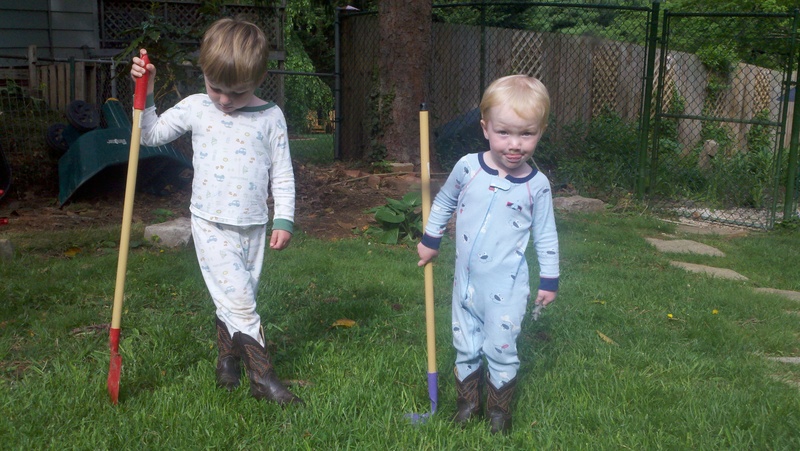 ), so as soon as I get done I’m rounding up the boys from their naps and heading out the door. Needless to say, my blog has fallen a bit by the wayside in the past couple weeks due to the new job, glorious weather, and the start of the growing season here in the Southern Appalachians. But we’re still here, hands in the dirt and feeling summer coming on strong! Stay tuned!